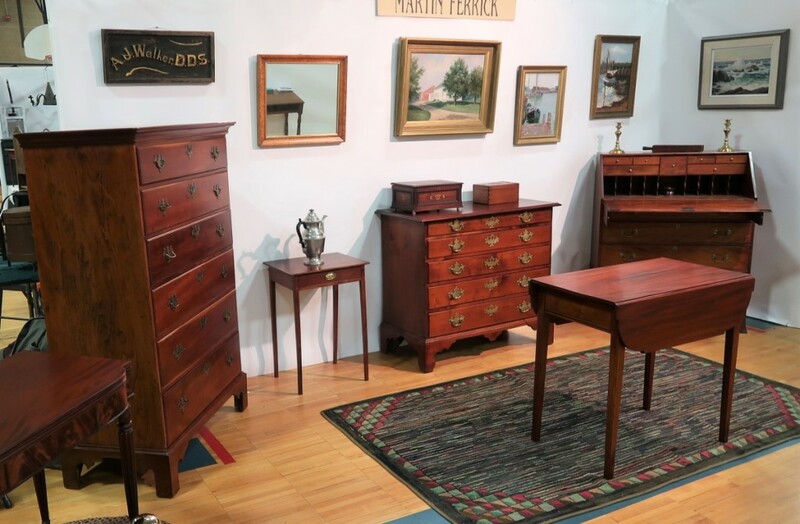 Vaughn Antiques, Stafford Springs, Conn.
TOLLAND, CONN. – It takes discipline to stick to one’s principles, as the Tolland Antiques Show has done for much of its 53 presentations. 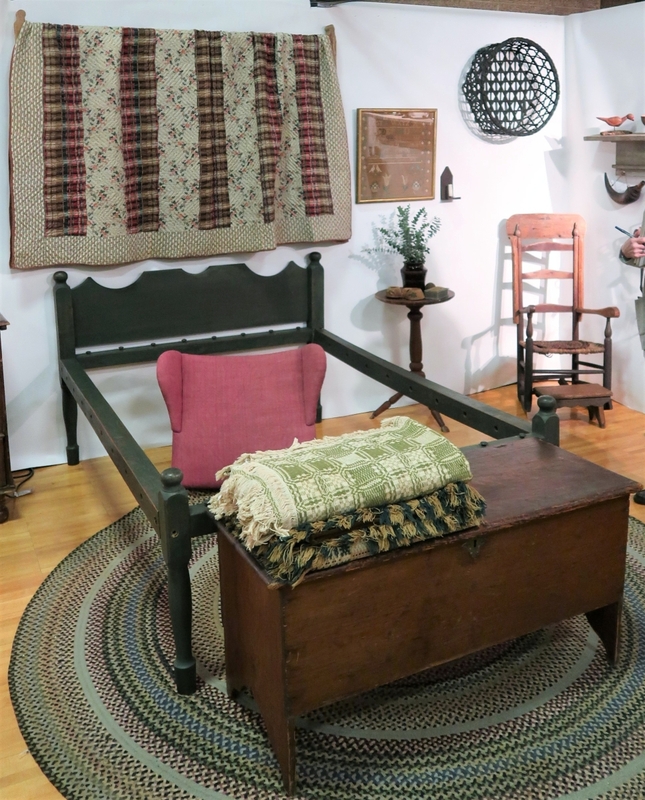 This small show in a bucolic but not inaccessible area of eastern Connecticut remains a favorite place for stocking up on early New England furniture, accessories and folk art. Intimate and inviting, it invokes a smaller version of many of the great country Americana shows of yore. In its latest iteration, the one-day event got underway on Sunday, March 10, at 9 am, at Tolland Middle School. Snow and dicey road conditions reduced opening attendance, but by 11 am there was a buzz in the air. Dealers were still selling at 2:45 pm, 15 minutes before the show closed. 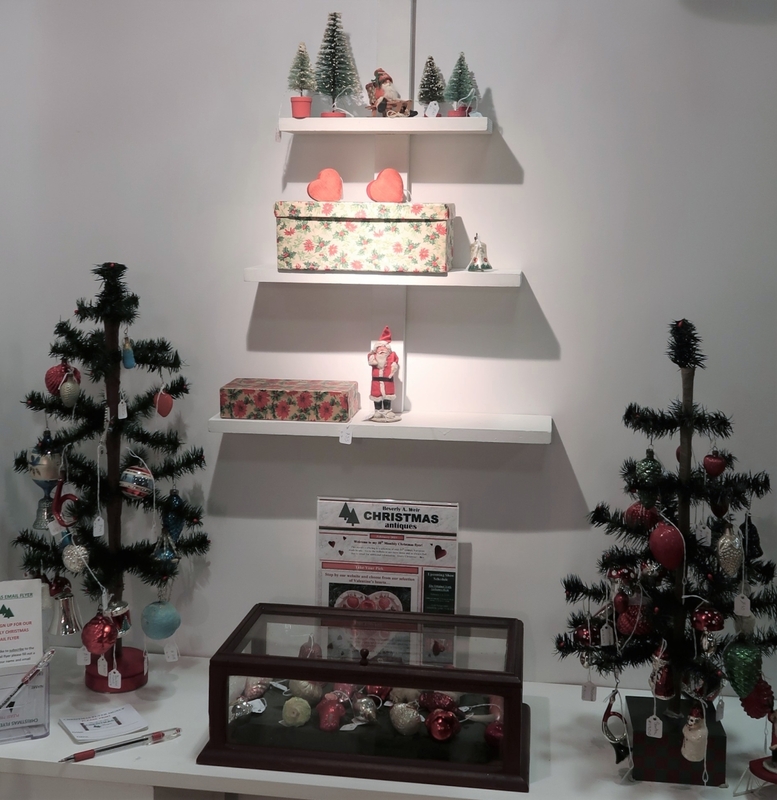 Exhibitors who succeeded in bringing in loyal clientele sold especially well. 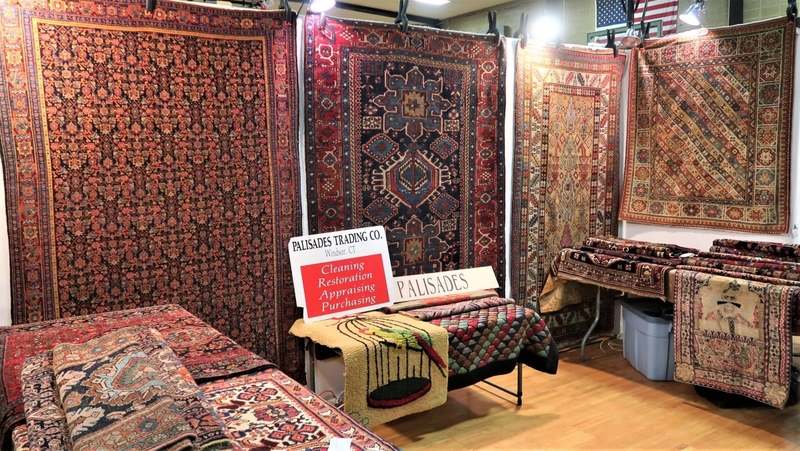 The fair was a few members short of the promised 40-plus exhibitors, a deficit attributed to health-related cancellations and a conflicting event in Boxborough, Mass., the latter prompting some Massachusetts dealers who might have exhibited at Tolland to stay closer to home. 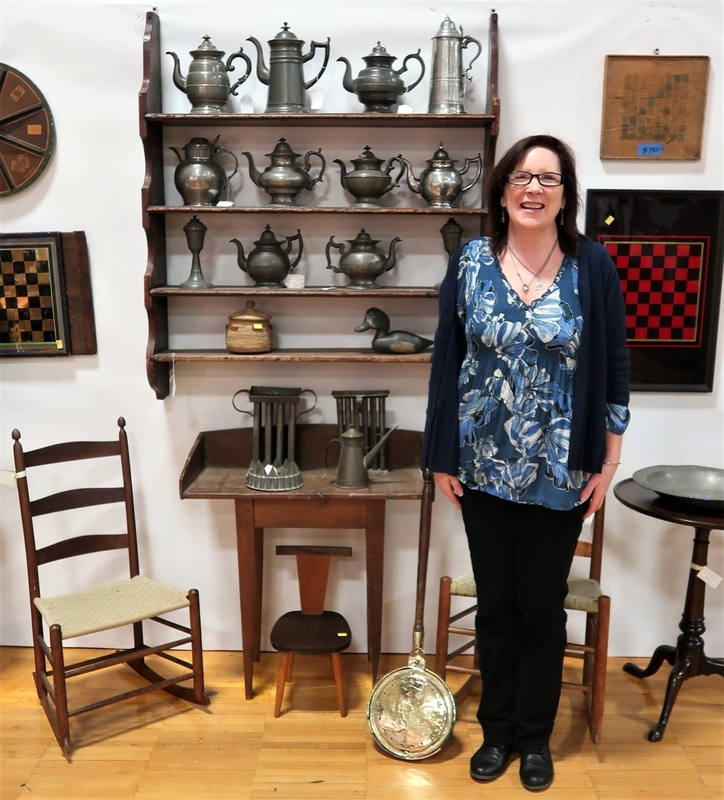 Mary-Pat Soucy, in her third year as director of the Tolland Antiques Show, hopes to avoid such a conflict of dates in 2020. 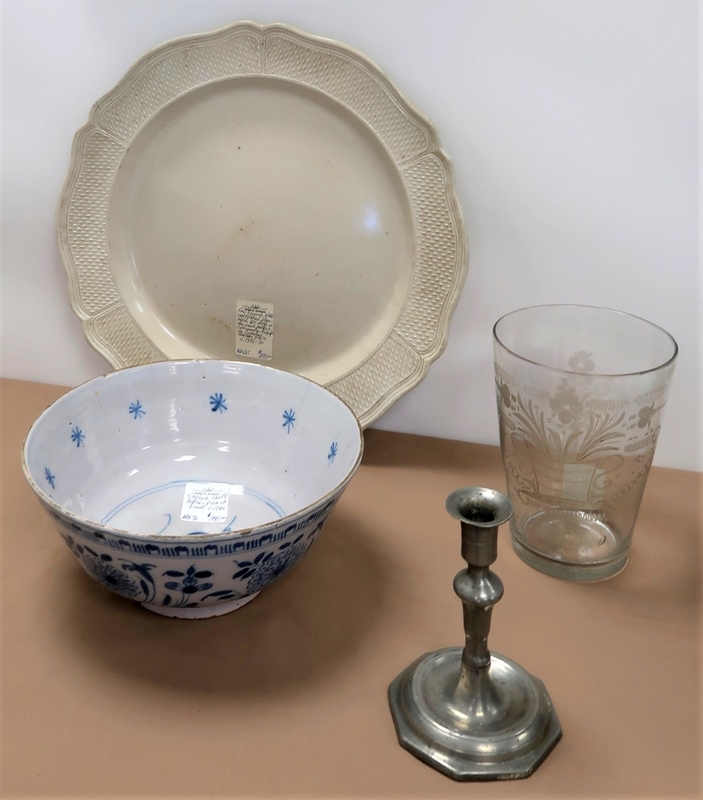 Proving Soucy’s point was Sharon Platt, a New Hampshire dealer with a purist’s devotion to early New England objects of historical interest. 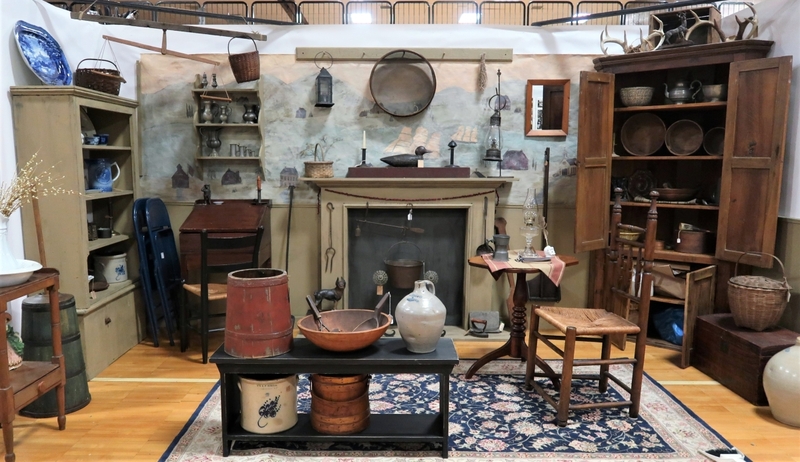 “I have a number of collectors in Connecticut,” said Platt, who sold a bee skep, a diminutive blanket chest in old red paint, hearth iron and more, soon after the fair opened. 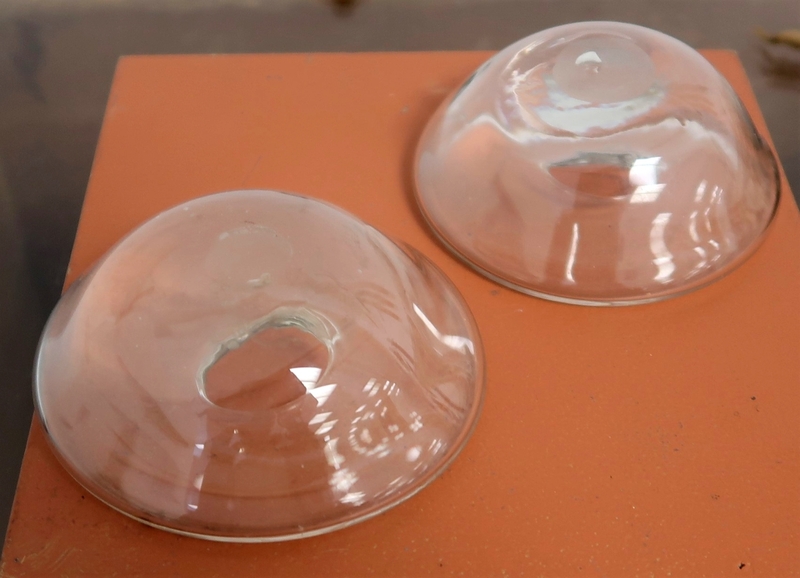 Her rarest offering may have been a pair of blown glass “lady’s leakers,” as the devices for new mothers are euphemistically known. “I have never had a true pair,” Platt said of the attic find. 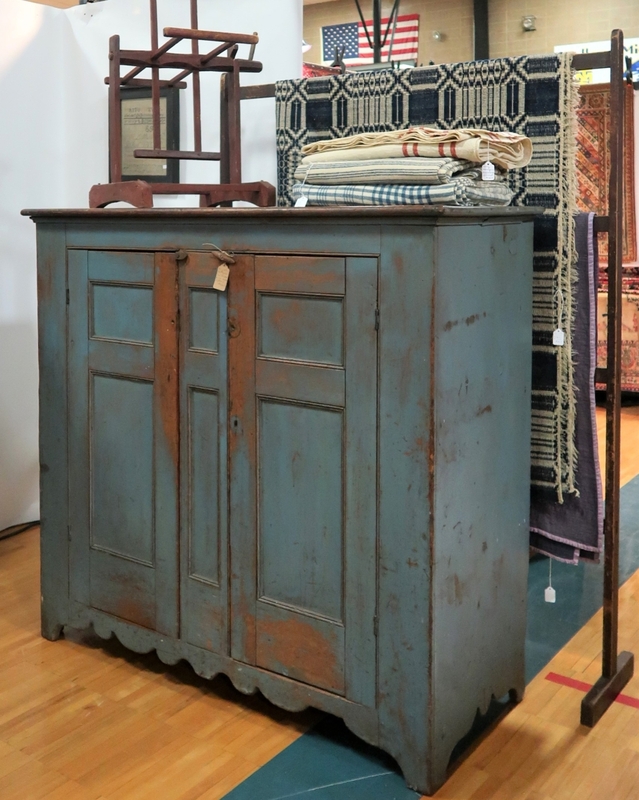 She also brought samples from her custom-created line of historic paint colors, now featuring three pigments meant to simulate whitewash. 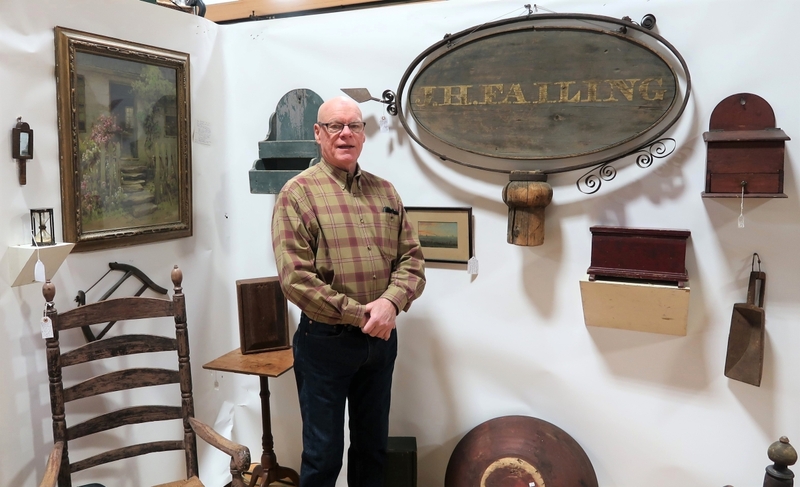 Connecticut dealer Derik Pulito’s showstopper was an Eighteenth or early Nineteenth Century tavern sign inscribed with the name J.H. 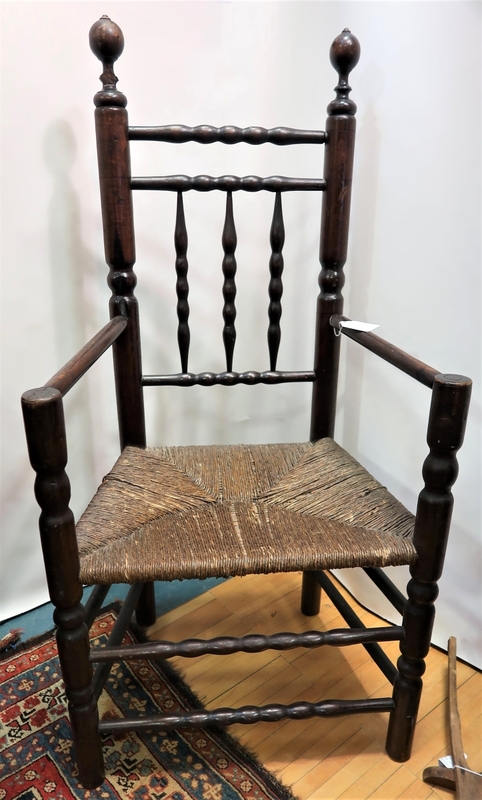 Fairling, St Johnsville, N.Y. Pulito presented the folk art treasure alongside a hutch table, bannister-back chairs and a great chair, specimens perfect for an Eighteenth Century Connecticut house. “It’s been great so far. 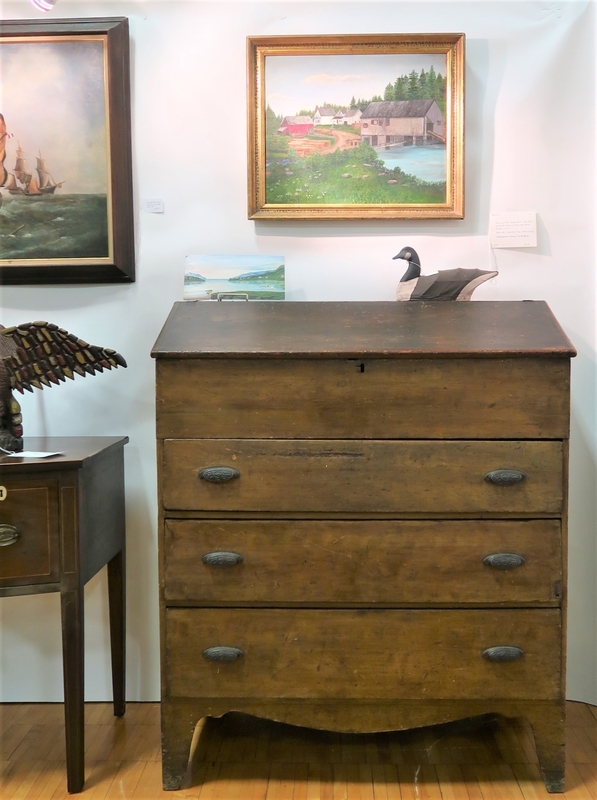 We sold a highboy and a whole bunch of decoys,” said John DeSimone of Goosefare Antiques, Saco, Maine. 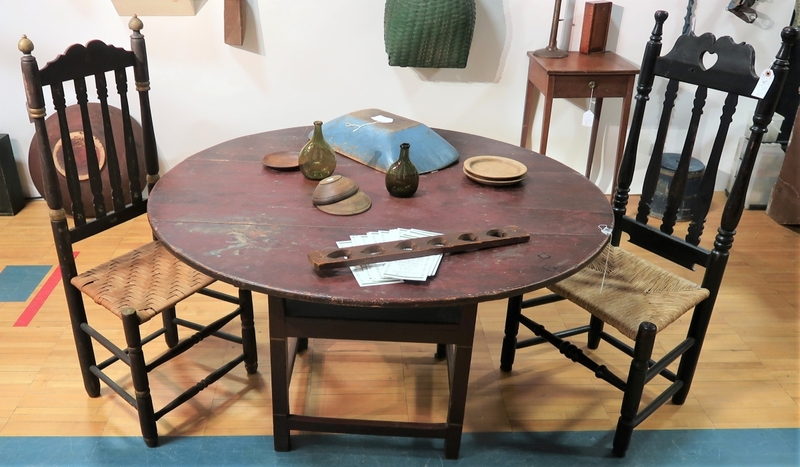 Windsor chairs and farmhouse tables are staples of Dan and Karen Olson Antiques. 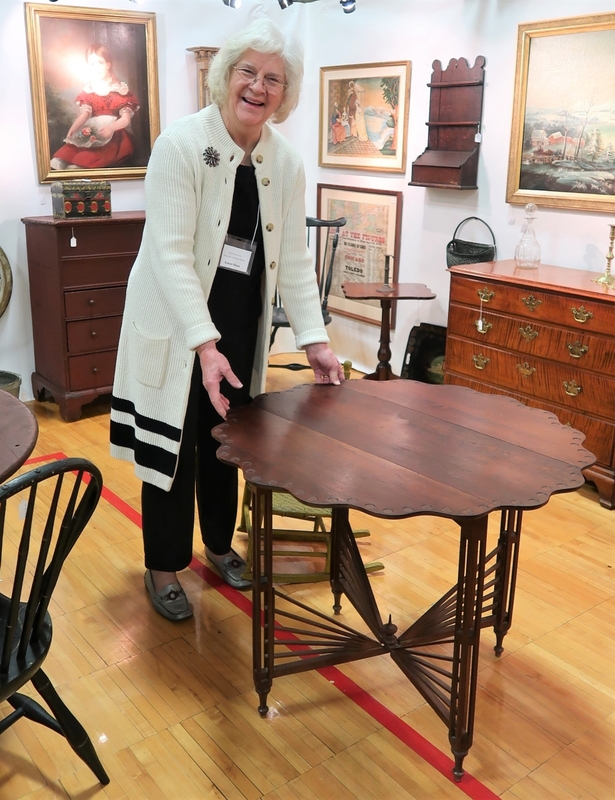 The Newburgh, N.Y., dealers spiced their display this time with a snap, or folding, table stamped by A. Cutler & Son, Buffalo, N.Y. 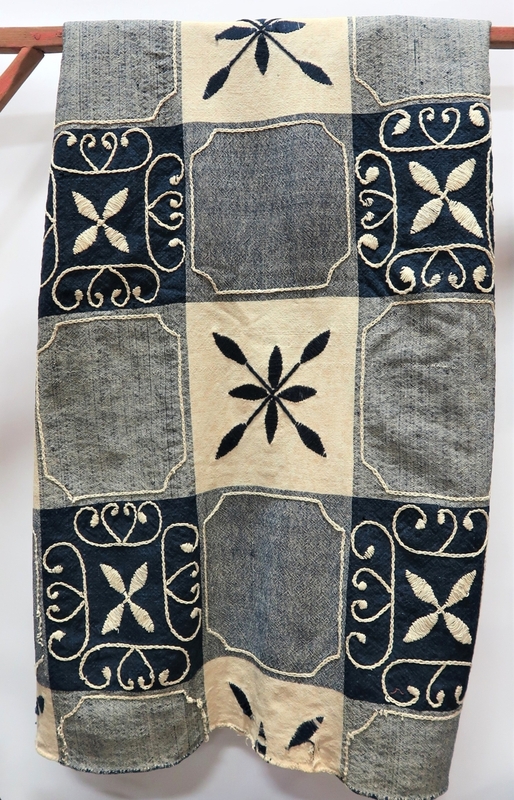 The vibrant piece has a scalloped top and stretchers like rays of light. 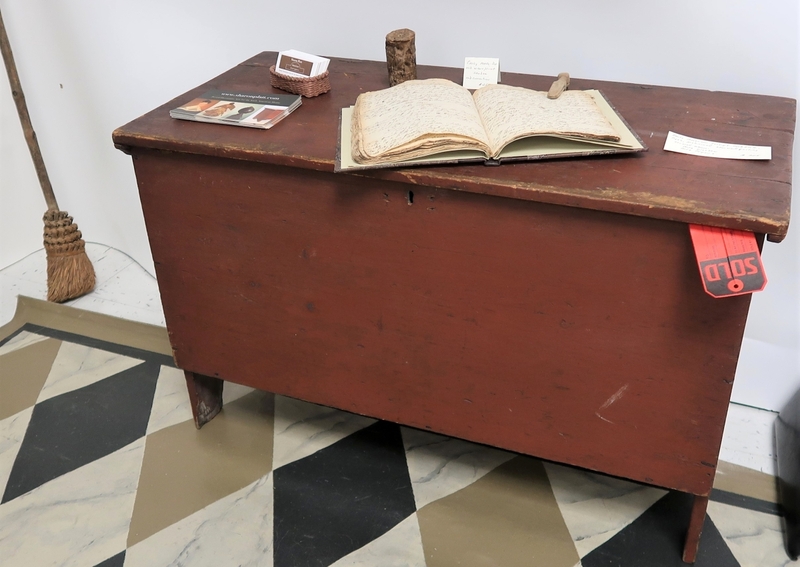 Trade catalogs for what became the Cutler Desk Company are housed at the Smithsonian’s National Museum of American History. 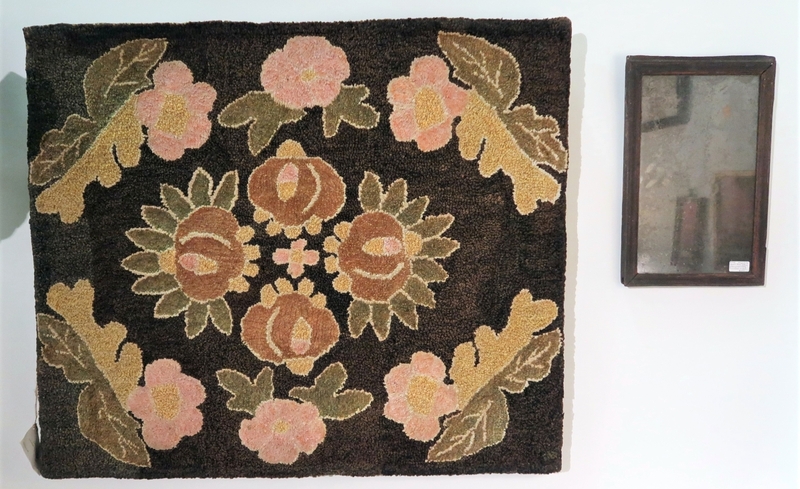 “I bought it from the guy who owned and renovated the store in Deep River, Conn., 30 years ago. 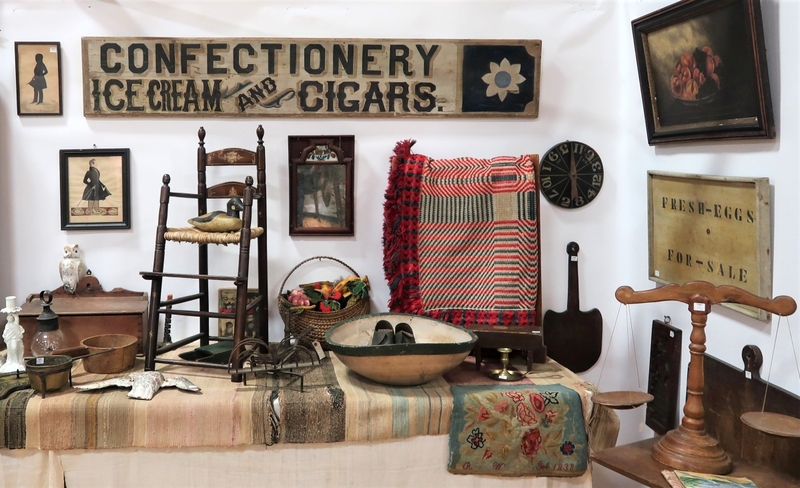 It had been enclosed between two walls for many years,” Vermont dealer Steve Corrigan said of his painted trade sign advertising confectionary, ice cream and cigars. 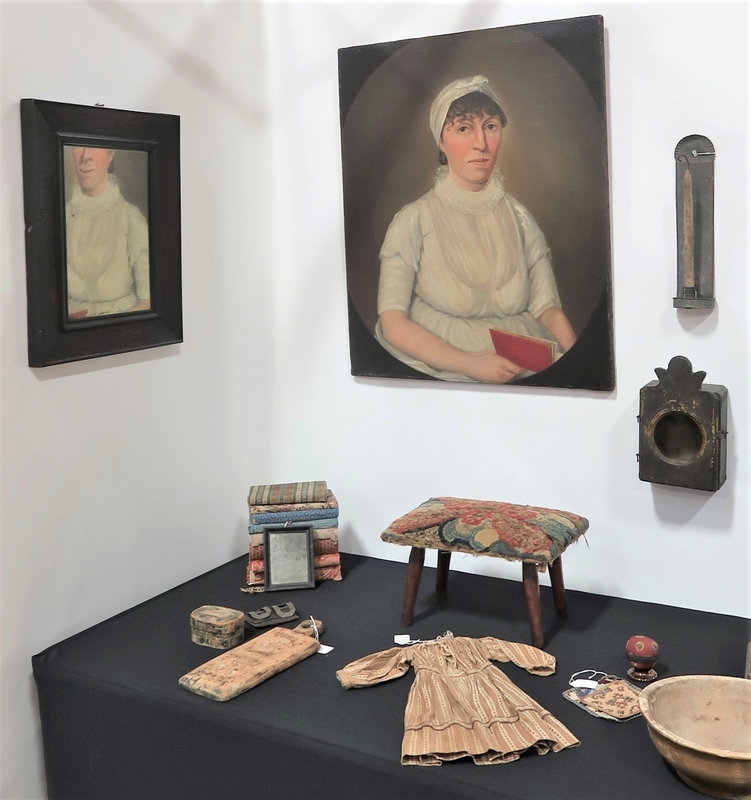 Other choice items at Stephen-Douglas Antiques included an embroidered homespun blanket and a superb Joseph Davis full-length profile portrait on paper. 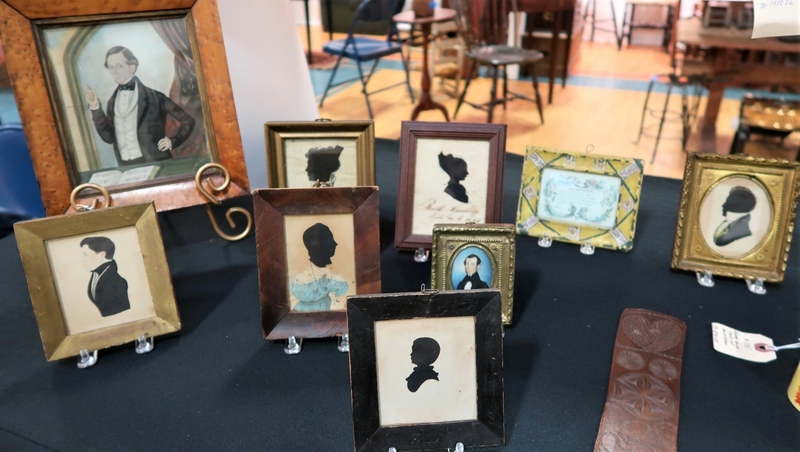 More portrait miniatures and silhouettes were for sale in the booth of Searsport, Maine, dealers Dennis Raleigh and Phyllis Sommer, who featured works by Amos Holbrook and Justus DaLee. “It’s not signed but I think it may be by William Jennings,” Randi Ona said of a circa 1810 oil portrait of a woman reading a book. 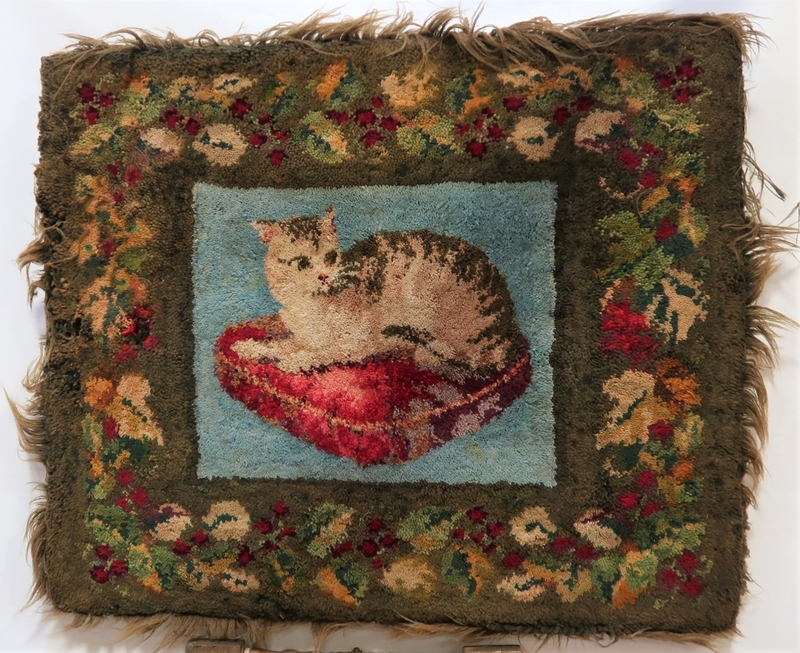 She paired it with a small stool covered in what appeared to be a fragment of an early yarn-sewn rug. 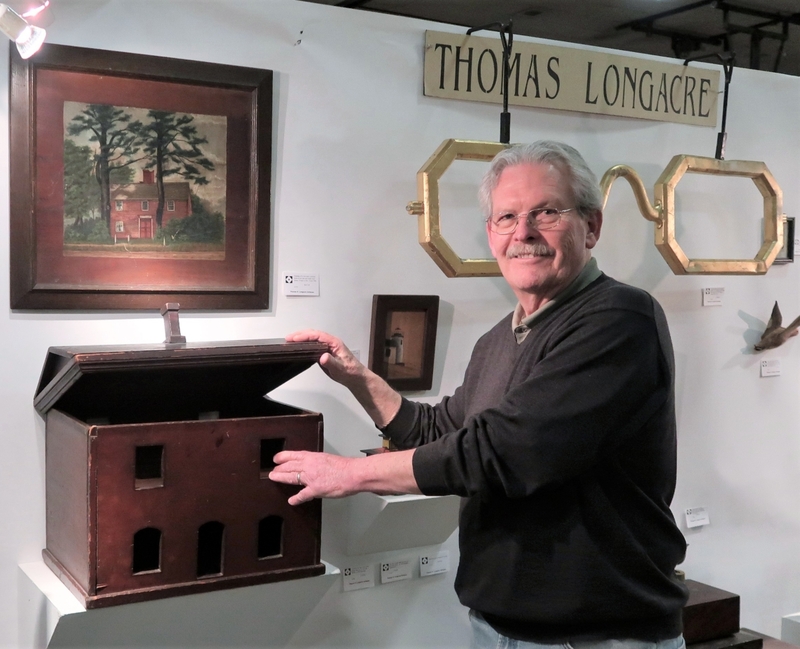 Other class acts included Marlborough, N.H., dealer Tom Longacre, a specialist in painted furniture and folk art, and his wife, Beverly Weir-Longacre, the authority in Christmas antiques. Working with her tech-savvy son, Bev is now mailing a monthly newsletter. Each issue is themed. 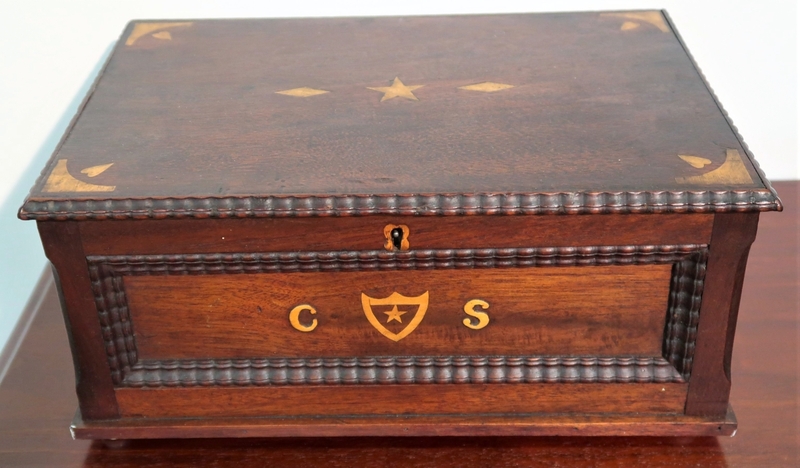 Her March flyer focuses on a George Washington collection. 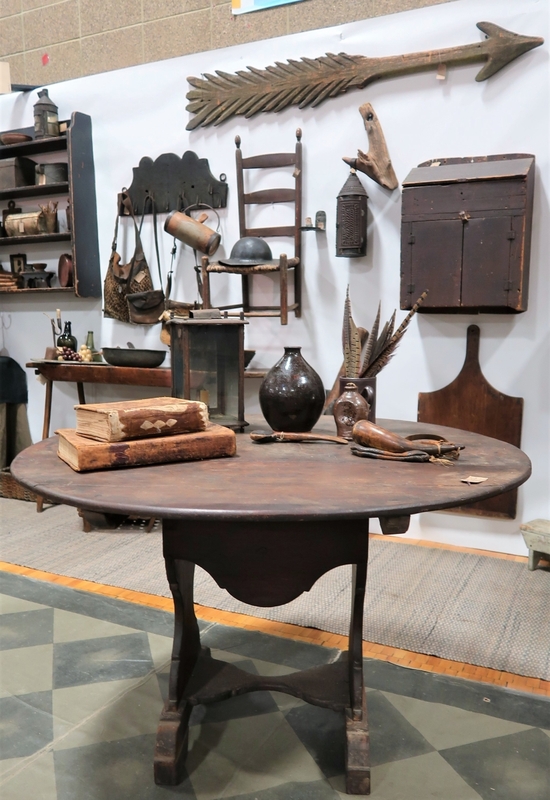 Martin J. Ferrick Antiques, Lincolnville, Maine. 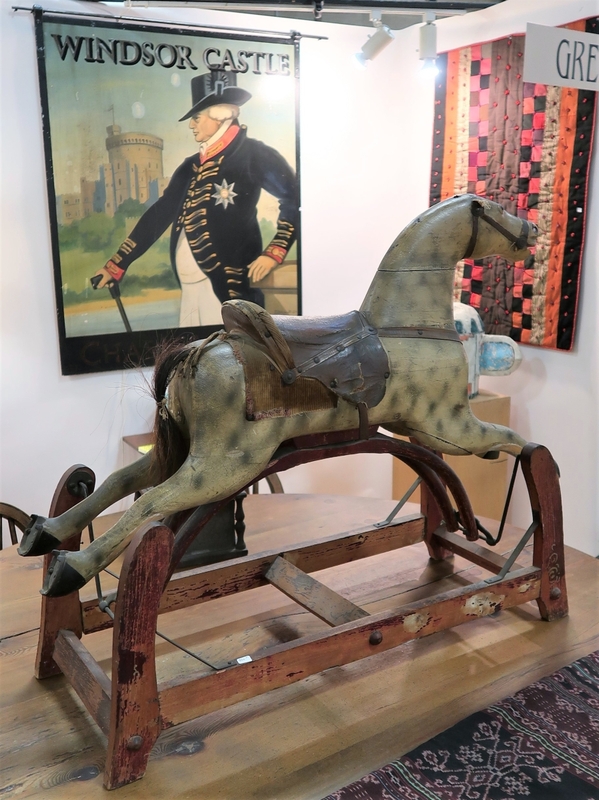 Greg Hamilton of Stone Block Antiques, Vergennes, Vt., was on hand with a two-sided English pub sign advertising Windsor Castle and a rocking horse in fine old condition. 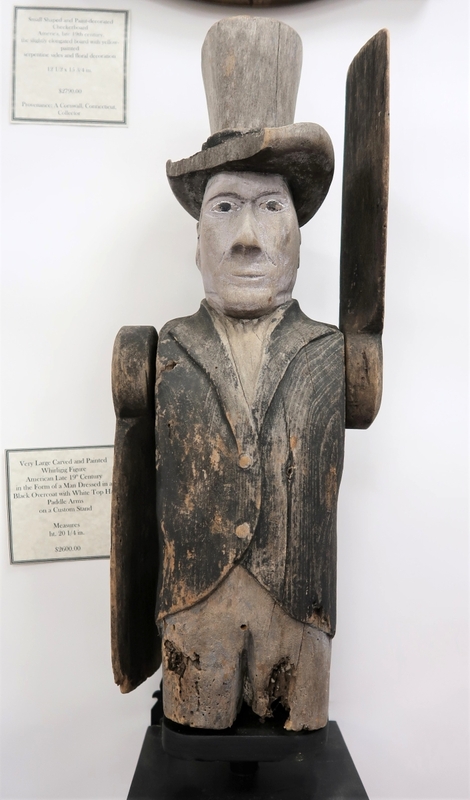 A large fragment of a carved and painted whirligig fashioned as a man in a top hat stopped traffic at Quiet Corner Antiques, Sterling, Conn.
“It’s fresh to the market. 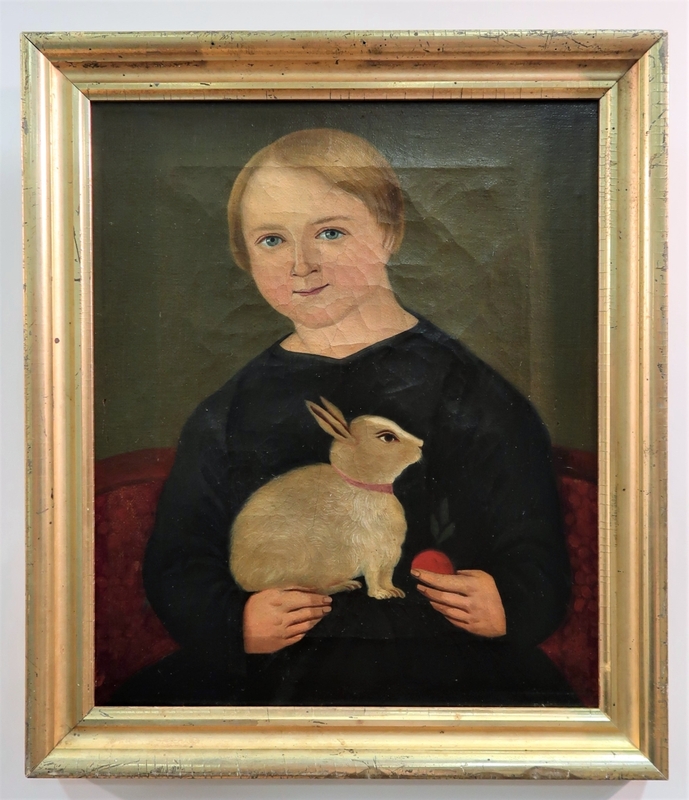 I bought it here,” Laura McCarthy of Bayberry Antiques, Rockland, Mass., said of her oil on canvas portrait of a child with a rabbit. 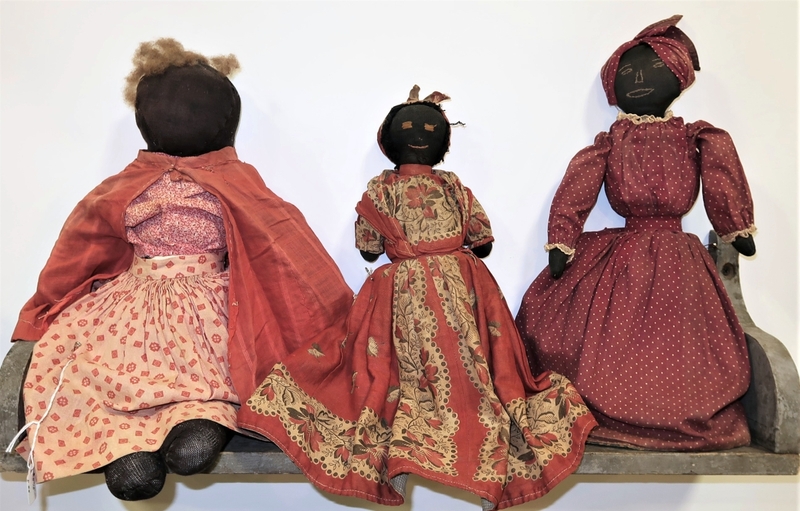 “Judy searches hard for these,” said Cy Stellmach of Blue Dog Antiques, Stafford Springs, Conn., pointing to a trio of rag dolls, two of them topsy-turvies. 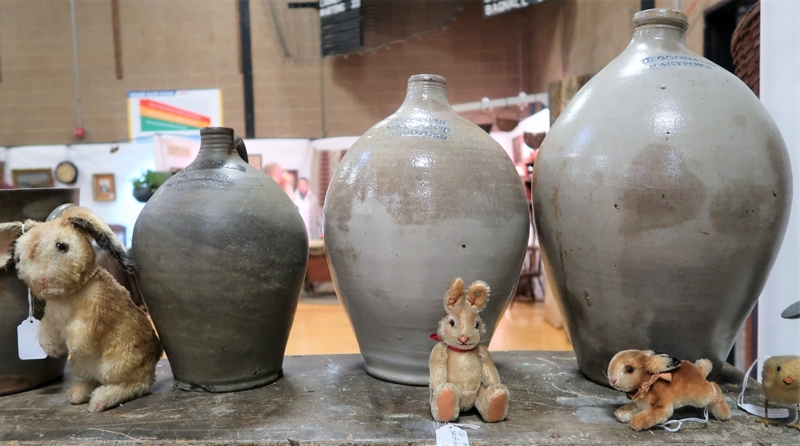 Steiff bunnies lent an Easter spirit to a selection of marked Connecticut stoneware at Pantry Box Antiques, Stafford Springs, Conn. 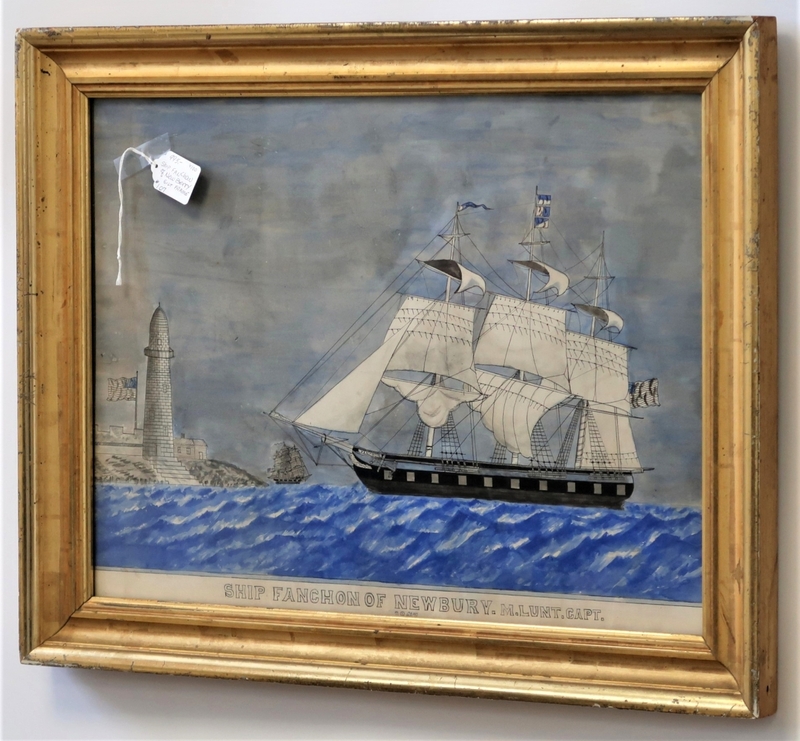 Both David Menzies and Ray Foster retailed antique paper. 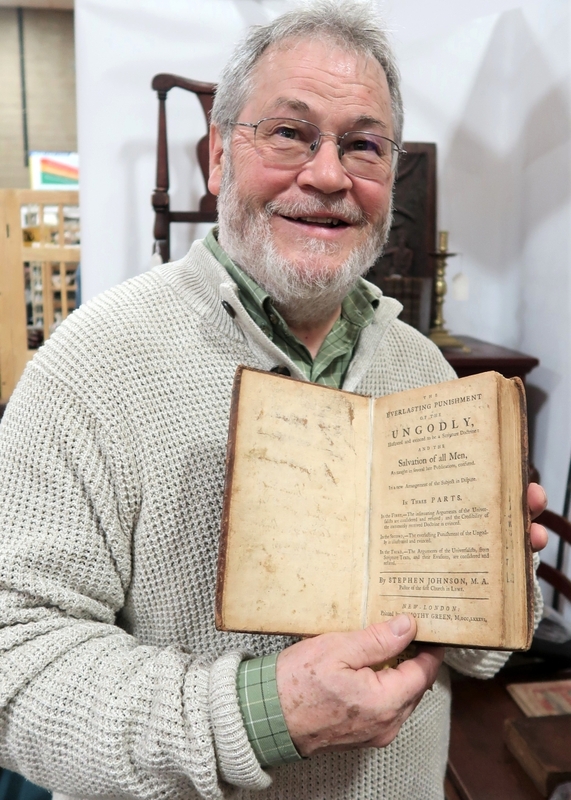 Menzies, proprietor of New England Books and Antiques of Woodbridge, Conn., offered a 1786 volume by a Lyme pastor, printed by a New London, Conn., publisher. 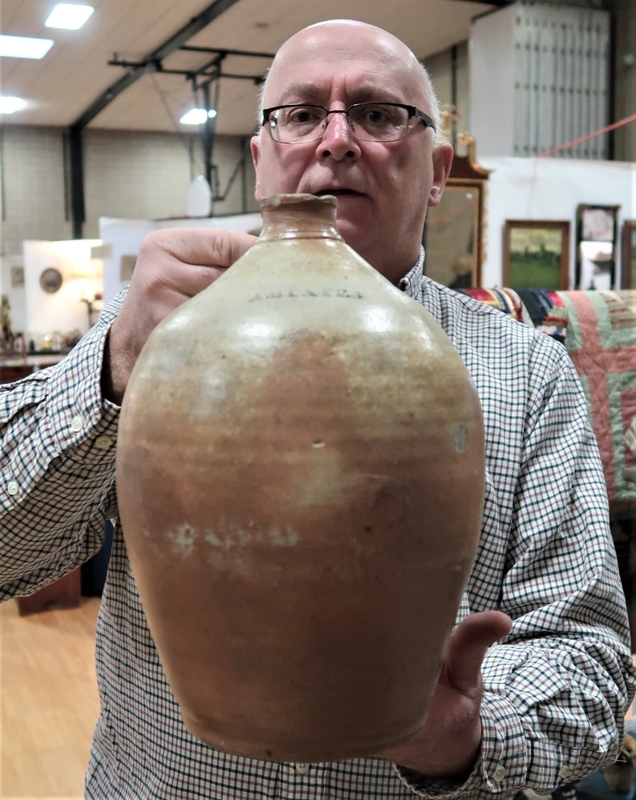 “I’m a big collector of documents,” said Foster, who arrayed Connecticut River Valley deeds and Revolutionary War military documents. 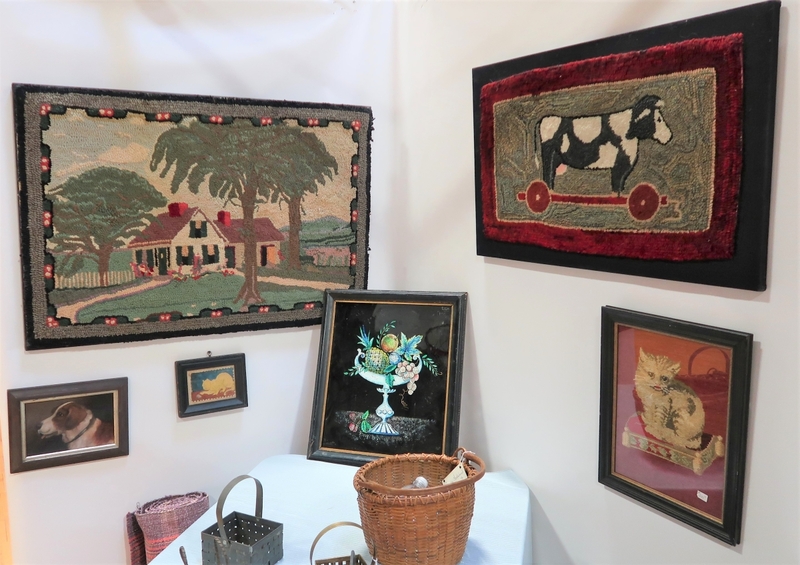 The show is the largest fundraiser of the year for the Tolland Historical Society, which mounted a loan presentation of quilts from its collection in advance of its big exhibition of the same this September. Additionally, show parking was easy and free, and the lunch provided by Willington Pizza toothsome. “Our dealers realize that the market is changing. They are changing, too. 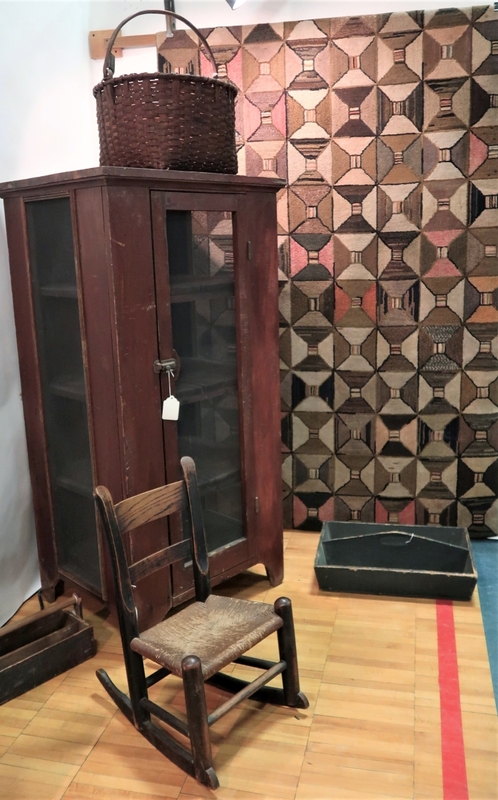 But the Tolland Antiques Show retains a standard and reputation of which I am really proud,” Soucy told us. 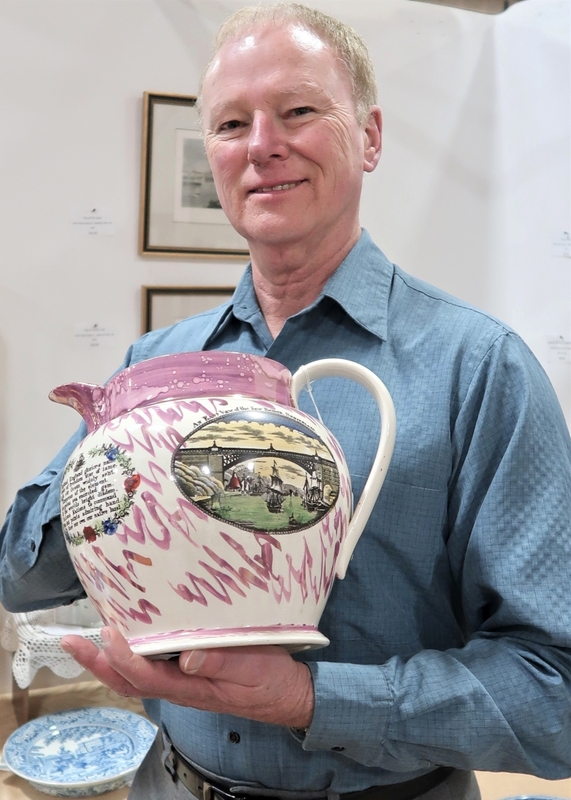 For more on the Tolland Antiques Show, contact Soucy at mpsoucy@comcast.net or call 860-803-0034. 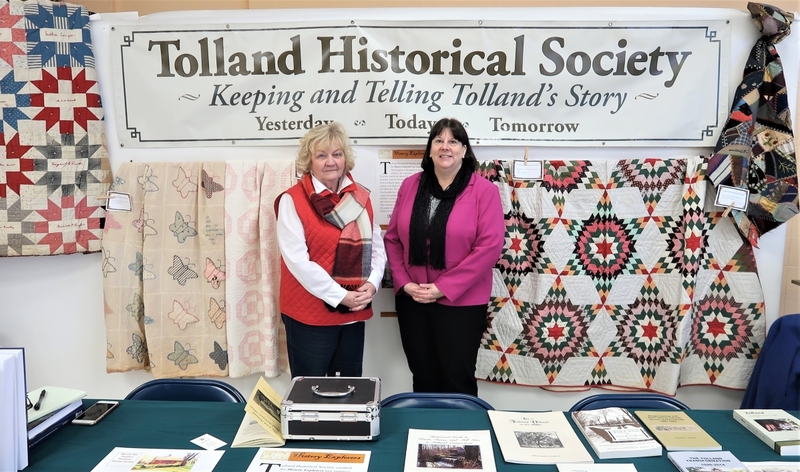 For more on the Tolland Historical Society, go to www.tollandhistorical.org.